Once your pipeline and/or process equipment is operational, we can provide a number of services required to ensure that your pipeline meets all of your maintenance needs and regulatory requirements. Our proprietary leak detection methods enable us to locate non-surfacing leaks as small as a pin-hole on buried pipelines during hydro-tests with 99.9% Accuracy – WITHOUT EXCAVATION. These same methods can be used to locate leaks in process equipment such as heat exchangers with 99.9% accuracy as well. Our tracer gas is in regulation with the CFR 49 parts 192 & 195 and will receive DOT certifications to keep your assets in compliance. Alpha provides contract engineering services to our customers, in both short-term and long-term obligations for our customers needs for design and installing services. This can be through our Pipeline Integrity Management annual surveys or services that are required with new installation units. Systems will need to be upgraded based on the rapid technological changes and facility changes of our customers. 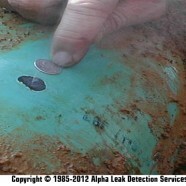 Alpha will perform the most cost effective solution in changing out cathodic protection systems. One of the best ways to upgrade a system is to apply brand new anode fittings to the unit to improve a longer life on the unit as well as a higher output. Stray current can press hard down on facility assets and destroy these units with accelerated corrosion rates. Alphas engineering team can assess whether or not stray current is apparent within the vicinity and eliminate these currents so it will not harm valuable assets. Extreme levels of electric current in A/C and D/C transmission pipelines can induce nearby assets. The current travels along the structure and then landing on ground level which can destroy the pipe through gouges, cracks, and blowouts. Alpha provides state-of-the-art AC and DC interference software that can mitigate A/C and D/C from damaging your lines. We then monitor these lines to test for any stray current of impact from A/C and D/C. After assessments are finished, Alpha will provide you with detailed final reports to give you the full run-down of the status of your pipelines. Alpha’s engineering team provides our customers with detailed reports of how effective our assessments were and whether or not corrosion were identified using a particular method. Then the evaluation of the metal loss will be re-assessed at intervals to calculate the location and the quantity of loss. Alpha’s Pipe Current Mapper (PCM) can help find the depth of cover, the location, and elevation of the pipeline with a GPS system during Alpha’s decommission/retire phase to give our customers full fledged data of the pipelines. Our other method is to use an electric sweeper and line locator which will provide markers, valves, and obstacles to show on our mapping software the points of these units are shown. Click here to consult an Alpha representative today!